Wednesday's 6:30 - 7:30 p.m. and Saturday's 8:00 - 9:00 a.m.
​Located between Lee Road and Fairbanks Avenue on Edgewater Drive, lake side. There is plenty of parking! share in the empowering, therapeutic, and symbolic sport of dragon boating. ​provide unconditional love and support... ​and share a bond that reaches far beyond the cancer experience. ​The sport of Dragon Boat racing originated in China more than 2500 years ago. The Dragon, molded into the shape of a 40-foot canoe-like vessel, symbolizes protection from evil and disease. A drummer who sits at the front of the boat on a high stool beats out the cadence of the race on a large drum nestled inside the craft. There is a steers person on the back using a large oar as a tiller. Teams of 18 to 23 people sitting on benches 2 in a row paddle to the beat of the drum for an average of 300 to 500 meters. The WOW logo, designed for the team by Christopher Archer, comes with a strong story. The central concept is a representation of the Greco-Roman sculpture of Diana, Goddess of the hunt and moon, with an infusion of Amazonian warrior history. ​The Amazonians were known to remove a breast so they were able to pull a bowstring taut during battle. In the logo, the bow is pink, representing the universal symbol for breast cancer. But this bow is a weapon: a pink dragon boat, a symbol of each woman's determination to win the battle against breast cancer. The warrior represents every woman dealing with breast cancer... thus, she has no face. She has no hair, symbolizing the loss many breast cancer patients experience. Yet, she is woman: strong and resilient, feminine in her own right, standing to face her attacker, and aiming high! Amazonian history records the sense of family...community tribal strength forged between each woman. Warriors on Water are remarkable for their commitment to Dragon Boating, to each other, and to their individual and collective battles against breast cancer. Breast Cancer and upper-body exercise didn't always go together. For many years, people were afraid that upper-body exercise would cause lymphedema, a dreaded and disfiguring condition that starts in the lymph system. ​Dr. Donald McKenzie, an exercise physiologist at the University of British Columbia in Vancouver thought that it made more sense that upper-body activity would improve the lymph system. He began research and then trained the first group of Breast Cancer Survivors to compete in the 1996 World Dragon Boat racing Championships. The goal was really just to prove that women could get back into life after Breast Cancer and didn't need to sit on the sidelines worrying about lymphedema if they got themselves onto a proper exercise program. McKenzie's study showed that when done correctly, repetitive upper-body physical activity wasn't a problem. 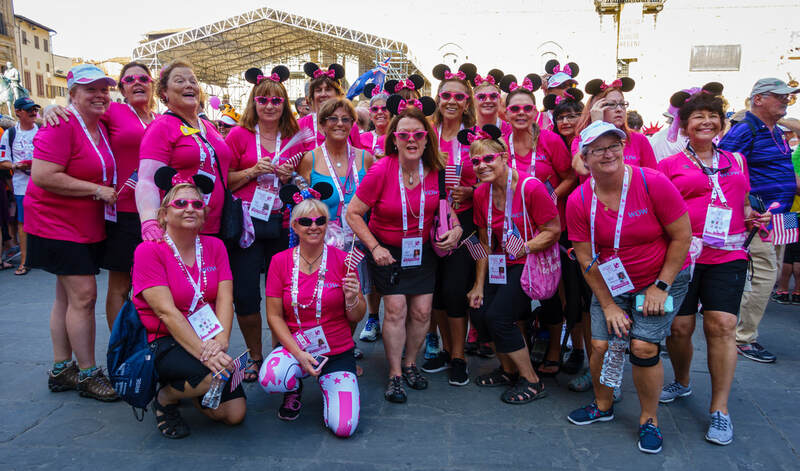 Soon Dragon boat racing teams comprising of Breast Cancer Survivors started popping up worldwide - in fact, the Breast Cancer Survivor division is the fastest growing area of the sport.